This camera lens mug overwhelms me with geek joy. It comes in both a Canon” and “Nikon” model, and looks just like the real thing, but more caffeinated. The mugs are equipped with an easy to clean, heat preserving, stainless steel lining, a lens-cap lid (omg), rubber-grip focus and zoom rings, and an auto-focus switch that actually switches. To top it off, the “Nikon” mug zooms when you twist its grip. The mugs are available from Photojojo for $24 (Canon) and $30 (Nikon). 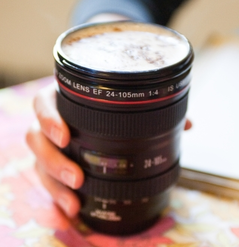 Lens mug really look so cool. Is that now out in the market or just a promotional products from Canon and Nikon? I like this reading about camera lens mug.